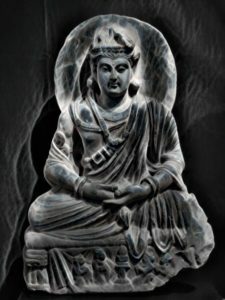 The Benevolent Bodhisattva Maitreya arose from his seat in the sacred assembly, bowed and then prostrated himself at the feet of the Tathagata and then circumambulated about him three times to the right. He then knelt down and with hands clasped in a manner depicting sublime devotion, invoked the Blessed One. Maitreya: the very name means “loving kindness.” It is stated that Maitreya is presently a Bodhisattva in the Tushita heavens, a place of complete contentment and joy, and there he continually contemplates the skillful means that will one day liberate all sentient beings. It is further stated that one day he will leave these heavens and become “reborn” in the womb of a woman, who, for ten months, will care for his developing and radiating body. Afterwards, within a sacred grove of beautiful trees she will grab hold of a sacred branch, and, standing up she will give birth to Maitreya. He will then emerge from the “right side” and raising his eyes to the ten directions will speak the following words: “This is my last birth and there will be no more rebirth after this one; hence, now all pure, I shall win Nirvana!” In such vein, he will be the successor to Gautama Buddha. The prophecy of his arrival concerns a future time when the Buddhadharma is all but long forgotten. The questions raised by Maitreya in this sutra will induce severance from all attachments in the heart of the listener. Bodhisattva Maitreya then became filled with ecstatic-joy and became silently attentive along with the rest of the assembly. which impale them to the cyclic wheel of Samsara. they will soon win the Unborn Path to Liberation. Likewise, the two obstructions will permanently be destroyed. and thus abide in Great Nirvana. thus bringing to fruition their Compassionate Vows. thereby winning the Supernal Prize of Primordial Enlightenment. This entry was posted in The Sutra of Primordial Enlightenment and tagged affections, desires, five natures, Great Nirvana, Maitreya, sexual desire, Tushita heavens, two obstructions. Bookmark the permalink.